The Hotel School commissioned NDStudios to produce a iPad App to help them integrate data collection about prospective students and do away with pen and paper forms and manual database entry. 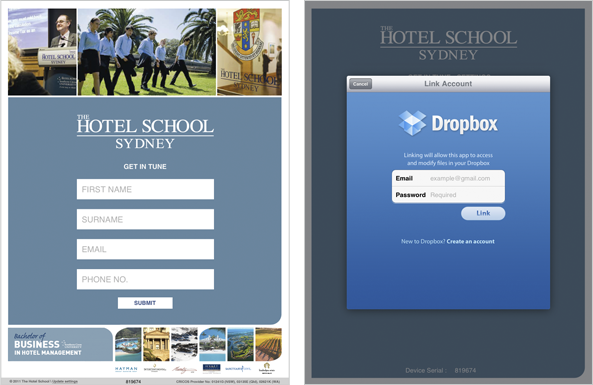 The Hotel School iPad App allows for the collection of contact information from prospective students. The iPad platform allows this information to be collected in any location, such as a trade show or meeting. The App automatically uploads the collected data to a linked dropbox account. Using this method the information can be retrieved from any web browser or dropbox enabled device for platform independence. The output is ready to be uploaded into The Hotel School's existing database.